Should You Hold Or Sell Your Land In Tucson? As a landowner in Tucson, you may have spent some time on the fence deciding if you should sell or hold your land. The answer isn’t always straightforward, there are quite a few variables to consider. In our latest blog post, we will ask a few questions to help you decide if you should hold or sell your land in Tucson! Sometimes people receive land as part of an inheritance or settlement. You might enjoy the idea of having land in your name. However, it might make sense to sell your Tucson land and use the proceeds in a way that better serves you. What Will Selling Your Tucson Land Really Cost You? Selling Tucson land can be tough. There simply isn’t as large of a market for vacant land as there is for housing. If you decide to list your land with a Tucson agent, you will have to pay their fees and commissions just like the sale of a house. You will also have to wait around to receive your money. Land can sit on the market for months at a time. Another popular option to sell your Tucson land, is to work with a direct buyer such as We Buy Homes In Tucson. 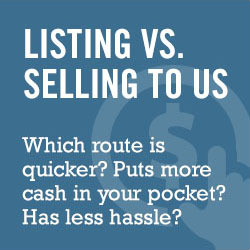 When you choose to sell directly, you won’t have to contend with fees, commissions or any of the other hassles of listing. When you sell to us, there is waiting around. We can close very quickly, allowing you to turn your unused Tucson land into cash right away!